The following description, taken from the Historic Landscapes Register, identifies the essential historic landscape themes. Topographically, the Caersws Basin presents a striking natural arena in the centre of Mid Wales. Visual prospects out of the basin are confined in almost every direction by the surrounding, seemingly unbroken, rim of low hills and ridges between about 300m and 400m above OD. The apparently enclosed but wide basin floor is essentially flat, rising only 20m in 5km, from 115m to 135m above OD, east-west. 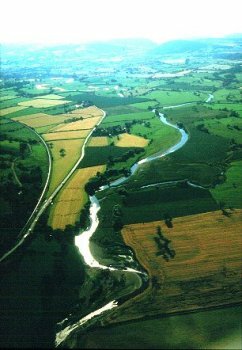 This remarkable, albeit shallow, natural arena has made the basin an area of exceptional strategic and historical importance in Wales, while the confluence of the Rivers Carno and Trannon with the Severn has also made Caersws in the centre of the basin a natural focus for communications. This was most clearly evidenced during the Roman period when a network of roads emanated from the Roman fort there, leading along the valleys and over the hills to the north. The remains of some roads are still visible in places. The combination of natural topography and evidence of man’s determination to control access and communication routes has thus created a landscape high in historic interest and integrity. A series of small Iron Age enclosures, now largely visible only as crop-marks, provide an indication of the prehistoric occupation of the area. A large oval enclosure surrounded by an interrupted bank and ditch has recently been discovered just to the north of Caersws, and excavations have provided an Iron Age date from the ditch silts. To the south west of Caersws the elaborate multivallate hillfort of Cefn Carnedd is one of the many sites put forward as a contender for the last stand of Caradog, although the association is somewhat tenuous. However, all these remains are clear evidence of intensive Iron Age settlement, and presumably farming, in the area. The Roman influence began with the early campaigns against the Ordovici, the Iron Age tribe occupying North Wales. A fort was constructed to the east of the present village of Caersws, but by about AD 75, this was replaced by a new fort sited near the confluence of the Rivers Carno and Severn. At its height, during the 2nd century, the fort would have been an impressive structure defended as it was by a substantial red sandstone rampart and a series of up to three external ditches. Inside the fort, successive excavations have revealed the plans of the main ranges of stone buildings and the remains of the timber barracks and stables. Around the fort, to the south and east, a sizeable civilian settlement or vicus became established, containing workshops, taverns, and a small temple as well as domestic buildings. The bath house, which was discovered in 1854, now lies beneath the railway yard. Little is known of the medieval history of this area. On the southern side of the basin, at Bronfelin and Moat Farm, are two motte and bailey castles, with evidence for possibly earlier enclosures. Caersws itself has a street plan which one would normally associate with a medieval settlement, although there is no archaeological evidence to support this. The local parish is in fact centred on Llanwnog which was reputedly founded during the 6th century by St Gwynog and which retains a medieval church. In recent times, the area is associated with the popular 19th-century Welsh poet and lyricist, John Ceiriog Hughes, who was sometime stationmaster at Llanidloes, and later, the line supervisor on the Cambrian Railways branch from Caersws to Van. He is buried at Llanwnog. The branch line to Van was constructed to carry the ore from the important lead mines at Van and Dylife, and like many of the original lines of the Cambrian Railways in the area, it was the creation of the industrialist and entrepreneur, David Davies. He made his greatest mark in South Wales , extracting coal from the Rhondda and exporting it along his own railway and through his own dock at Barry. His house at Llandinam, Broneirion, overlooks the village and is today the Welsh Girl Guide Training Centre. In the later part of the 19th century, the Davies family built Plas Dinam, which now dominates the northern approaches to the village, much of which was, in fact, created by Davies. Llandinam is notable as one of the first Welsh rural parishes to have electricity, in 1904. The origins of the village, however, are much earlier, as the church is reputedly an early Celtic clas or mother church foundation .